The world of Germany-born, Glasgow-based composer and sound designer John Lemke is a rich and varied one. Working in a variety of media, so as to enable him explore his fascination with music and “all things sonic”, he has dipped his fingers into a variety of collaborative pies, ranging from live performance and film sound design, to work as a documentary composer for British television broadcasters such as the BBC. In what appears to have been a kitchen utensil-fueled assault (he used these utensils to generate sounds from the body and strings of the piano), he has mined the past of an object redolent with meaning that is significant in terms both personal and global. On listening, these clever experiments with sound are not immediately apparent, but as you familiarise yourself with this work, the detail, subtlety, and musique concrète provenance of the compositions emerge. Within the structures of each piece there lie everyday spaces, and within those spaces reside narratives and a sense of place. A particularly clever trick Lemke employs to achieve this is “worldising”, that of playing back and re-recording sound through a room. There are moments reminiscent of the atmospheric and emotive musings of The Cocteau Twins and, in tracks like “Nolands”, the repetitive descriptions of Philip Glass — but on the whole, this album broadly tends to echo the more tuneful works of Aphex Twin, the grand atmospheres of Boards Of Canada, and the travelogue electronica of Northcape. The filmic “When We Could” is a beautiful piece built around that special Berliner piano, played this time in the manner it was designed for, and with a slow, marching cajun snare rhythm. Here there are moments of Fripp and Eno-esque reverie as the heavily filtered piano picks out a stark but pretty tune against backwards guitars. 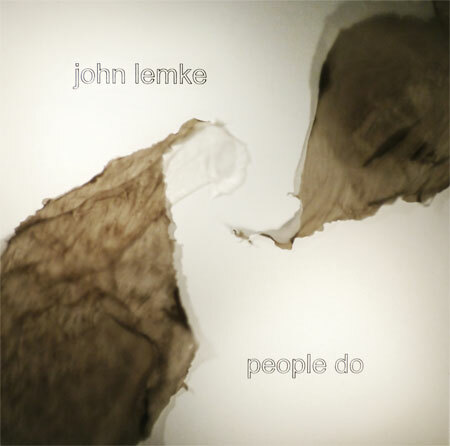 Lemke is clearly most at home corrupting and warping real world sounds and ambient atmosphere and combining the results with melodic cascades, and although I can see the appeal of striving for a danceable beat as a means of making his music more approachable, his pursuit of the beat can and does detract from the end product sometimes. Having said that, People Do, released on Denovali Records on vinyl, CD, and digital formats, is a fine debut from an artist with a wealth of experience. This is a rewarding listen that is perfect for headphones in a darkened room. Listen out for the beautiful of violin Kim Moore (ex Zoey Van Goey), that recalls the bow work of Simon House, on the track “Ivory Nights”. Most of all though, keep an ear out for an elderly piano which appears in the mix like a kindly and well-loved relative with a story to tell of times gone by.